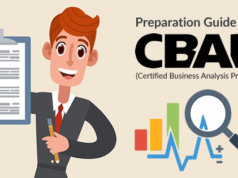 Blog Business Analysis How to Prepare for CCBA Certification Exam? Looking for CCBA certification preparation paradigm? Here we bring comprehensive guide on how to prepare for CCBA certification exam! 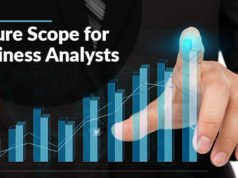 The Certification of Capability in Business Analysis (CCBA) is the level two professional business analysis certification offered by the International Institute of Business Analysis (IIBA). This certification is intended for the business analysis practitioners who want to get a recognition to demonstrate their business analysis skills and knowledge. 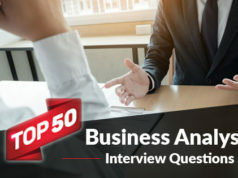 Being level two certification, CCBA acknowledges the business analysts who have a minimum of 2-3 years of experience in business analysis and want to extend their knowledge. How you begin the CCBA certification preparation matters a lot to pass the certification exam. 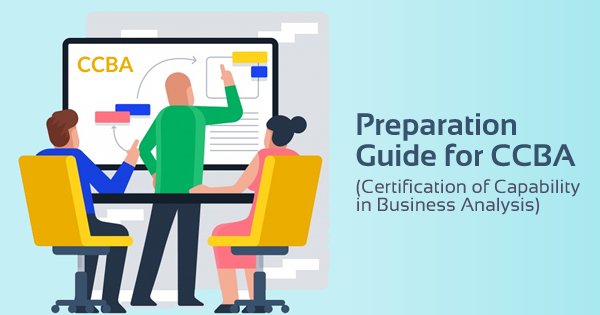 The candidate is required to meet some requirements to be eligible for the CCBA certification exam, So, before moving to the CCBA certification preparation guide, let’s understand the CCBA exam and it’s eligibility requirements. Certification of Capability in Business Analysis (CCBA) Certification is a globally recognized credential that is offered to the candidates who pass the CCBA certification exam. It is a formal recognition for the business analysts having minimum 2 years of experience. The certification exam is completely based on BABOK Guide Version 3 and consists of scenario-based questions. Are you an entry-level business analyst preparing for ECBA certification exam? Here is the ECBA Certification Preparation Guide to help you pass the ECBA certification exam. If you are planning to take CCBA certification exam, you need to satisfy the following eligibility criteria. ECBA certification exam is an web-based exam that you can take online from anywhere. All you need is a desktop or laptop, microphone, working webcam, and an active internet connection. There are some important points about the CCBA certification exam that you need to know before starting CCBA certification preparation. These are the features of the CCBA certification and may help you during your CCBA certification preparation. CCBA certification requires 2-3 years of working experience as Business Analysts, so if you have some experience and want to expand your expertise, CCBA is the perfect certification for you. The most important, CCBA is an online exam and you don’t need to visit any exam center to take the exam. You can even give an exam from your home, just have a computer, webcam, microphone, and internet connection. There is no prerequisite to take CCBA certification exam; there is an eligibility criterion that the candidate needs to meet to take the exam. The quick preparation trick to pass CCBA certification is – clarify all the concepts of BABOK and practice through as many practice questions as you can. The CCBA certification cost is high so you need to prepare yourself to pass the exam in the first attempt only. The application and exam fee get lower if you have taken the IIBA membership. It is not mandatory to take online or instructor-led training for CCBA certification preparation, preparing through the BABOK guide and practicing through mock tests is enough to prepare well. The questions that arrive in the CCBA exam are the scenario-based questions. You just need to prepare and practice well to solve different scenario-based business analysis problems. Preparing for the CCBA certification exam? Check your current level of preparation with CCBA practice exam. Be typical or simple, every certification exam needs a specific preparation path to be followed. So, if you want to pass CCBA certification exam in the first attempt, you need to follow the right preparation track. Once you’ve submit your application for the exam, it’s the time to start the CCBA certification preparation. So, just follow this CCBA certification preparation guide and get ready to pass the exam! When you are ready to start your preparation for the CCBA certification exam, first get yourself familiar with the exam information, exam format, and exam objectives. The CCBA exam information has been mentioned above. Now, understand the exam topics given in the CCBA exam blueprint with their percentage weight in the exam. The BABOK Guide is the comprehensive study guide for CCBA certification preparation. It is required to understand and cover all the concepts of BABOK guide for the preparation of CCBA exam. You need to manage time such that you can master all the knowledge areas of the BABOK guide. If you face any doubt, you can read BABOK guide two or more times to clear the concepts. Don’t leave anything as BABOK is just like the Bible for the CCBA exam. If you are not much into self-study then you can join CCBA certification training (classroom or online instructor-led training). You may choose any of the IIBA EEP (Endorsed Education Providers) for CCBA training so that the training will also provide you professional development units and will make you eligible for the CCBA certification exam. You can check out these recognized education providers and start training near to your location. Practice plays an important role and is very important to pass any certification exam. When you are done with the preparation and your think yourself prepared for the certification exam, you should start taking practice exams. The practice exams will help you get familiar with the actual exam format, thus will prepare you to take and pass the CCBA certification exam. Whizlabs offers best-in-industry CCBA practice exam to help you get prepared to pass the CCBA exam in the first attempt. Now, you are fully prepared for the CCBA certification exam. Just take the exam and earn your CCBA certification! Join Business Analysis discussion forums and study groups to get your queries resolved by experts and certified professionals. Submit your query or question in the Whizlabs forum and find the answer by subject matter experts. Don’t forget to read CCBA certification exam Frequently Asked Questions (FAQs) and CCBA Certification Sample Questions that are given on the IIBA website. Read BABOK Study Guide Version 3 multiple times until all of the concepts are clear. The CCBA exam is based on BABOK guide, so reading it well will prepare you to become CCBA certified. Read each chapter of BABOK guide to cover all the knowledge areas of the CCBA exam, and prepare study notes of the chapters so that you will be able to revise everything at a glance a day before the exam. Check the CCBA Certification eligibility and read the exam blueprint very well and prepare a study plan on the basis of the percentage weight of the CCBA exam objectives. Become an active member of the IIBA meetings and make sure you have all the study and preparation material to prepare for the CCBA certification exam. While practicing through practice tests, keep in mind that start from the knowledge areas first and after that try taking full practice tests, It will prepare you for the exam objective-wise. CCBA certification exam is the competency-based exam that consists of the scenario-based questions. So, you need to prepare yourself by going through different business analysis scenarios. To wind up, Certification of Capability in Business Analysis (CCBA) certification validates and demonstrates one’s expertise in business analysis domain. If you are a business analyst with a few years of experience, go for CCBA certification and enhance your career. We’ve prepared this guide to start your CCBA certification preparation in such a way that you could pass the exam. Whizlabs offers the most effective, result-oriented practice exam to help you in your CCBA certification preparation. Whizlabs CCBA practice exam prepares you for the actual exam and makes you confident enough to pass the exam. Accelerate your business analysis career with CCBA certification and support your organization move towards success! Want to know anything else about CCBA certification? Just put a comment below or write here, we’ll respond back in no time.. Thanks for the info. This was very well described. How is the BA experience counted? Though my current role responsibilities were similar to a business analyst I never had a BA role tagged to my career.